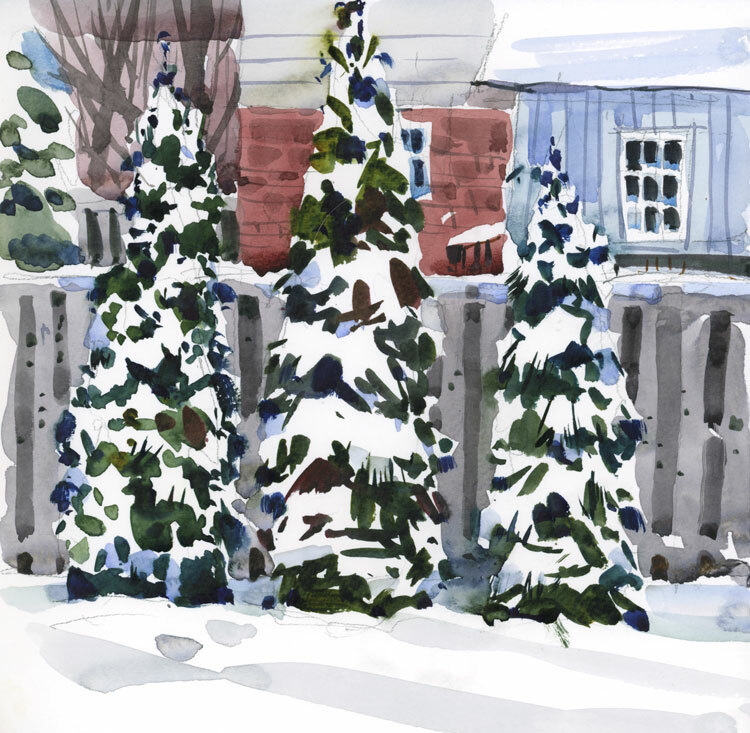 I can see these three cedars from my kitchen window, and despite their sameness of shape, with a bit of snow on them they become more interesting to sketch. Sometimes in winter, I paint the dark parts of a sketch first. That helps to set up the values correctly. A mix I like for evergreens is Phthalo Blue and Quinacridone Gold, with some Indanthrene Blue added in for the deepest darks. Sketched in a Handbook Watercolour Journal, 8″ x 8″. I just love them Shari!! Perfect – and a wonderful lesson in negative painting. Hope it’s not too early to say Happy New Year! It’s not too early Tony. Happy New Year to you too! So so so beautiful today! It was an amazing day, both for painting and just getting out for a walk. Hope it stays like this. I hate rain in winter. Wow, makes me want to go practice. It’s beautiful. Again, super gorgeous! and so close to home too. Happy New Year Shari. And you too. All the best for the new year! Another lovely winter painting. Thanks for the tip on using rough paper. I never thought more water would work though I have noticed the difference when changing to 300 lb. from lighter papers. Hi Judy, Yes, the thicker the paper the more water is required as well. And the more colour gets absorbed. Have you noticed that too? Makes me smile…you really enjoy what you’re doing and it shows! What’s the mix for the light grey above the middle cedar and reddish background to the left? I did really enjoy painting this one Gil. I find it funny that you realized this from looking at my sketch. Another friend commented the same thing. I think it’s because I have more time to paint during the holidays and I am having a really fun time with it. Hope you are well. Happy New Year and may you continue to paint many more masterpieces in 2017! As usual your trees are gorgeous and alive even if its in the winter. Thanks Andre. I have been thinking about you because I am due to paint some streets in Lachine in the new year. Have a happy 2017 Andre. Sooooo nice. Happy New Year Shari. Thanks Lee. Happy New Year to you too. Those cedars are spectacular. I love your winter scenes. Have a wonderful 2017 with lots of opportunity to paint wherever you are. The first thing I thought when I looked at the cedars was “what a great green – wonder how she did that?” Thanks for letting us know. 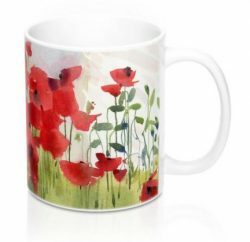 I love your watercolors and have learned much from your blog. Thanks so much and Happy New Year!! I just found your website, Shari, and will now be an avid follower. You are so gifted- to be able to come up with something as beautiful as this, right from your own window. Please put me on your workshop list. I see you’re booked for 2017, but if anything else opens in the fall, or in 2018, I would love to attend. In the meantime, I’ll take your Craftsy classes! Thanks so much for writing. I will certainly put you on my workshop list. I haven’t posted anything yet for 2017. I think you were looking at the 2016 workshops. If you need a discount code for the Craftsy classes, let me know and I will send it to you.